snowdeal.org > ex machina: the eric update - day 317: really pretty much almost probably just about crawling! the eric update - day 317: really pretty much almost probably just about crawling! i thought, for reasons that seem fairly silly in hindsight, that infants instantaneously discovered that they could crawl. that there'd be a discrete moment when all of a sudden they figured out that they had the ability to propel themselves across the floor. but, at least with odin , it seems that things are so clearly defined and for the past day or so he's been really pretty much almost probably just about crawling! 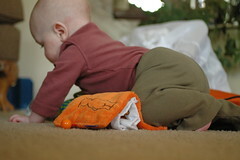 every so often, when he's really motivated, he'll move his hands and feet together in a way that's more coordinated than even just two weeks ago and "crawl" a few inches towards whatever has captured his interest. he's not overly confident in his new ability, but i think it's (almost) safe to say that he really has started a new era of personal mobility! Go Odin, Go! Go Odin, Go!!! I actually saw the exact same thing with my son that you're seeing with Odin. For weeks it was obvious that he was so close to crawling but just hadn't made the final connection. And then one morning I put him on the floor to play and he just crawled away.